Tango music lives with a strong tradition of renewing existing compositions with different arrangements, sometimes in a really different style. 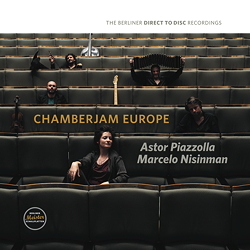 ChamberJam Europe's new direct-to-disc album takes the listener through the history of Tango in various respects: There are entirely new, modern Tango compositions by Marcelo Nisinman, there are new arrangements of old Tangos, and there is a collection of pieces with the theme "L'histoire du Tango". "Hombre Tango" is an obsessive piece including sections with irregular rhythms, which are not so common in Tango music. Even though it is Tango, it breaks with the tradition. "Oblivion", on the contrary, maintains its original melancholic and expressive mood, although the new arrangement is completely different than the original one, breaking its sweetness, especially in harmony and counterpoint. "Pourquoi tu te leves" is almost psychedelic. It is a story of love, starting well and ending bad. "El Entreterriano" is officially considered the first Tango in the history of Rio de la Plata. The new arrangement comes with a totally different language - the musical language of Buenos Aires, one century later. "L'histoire du Tango" is one of the last compositions by Astor Piazzolla. He resumed the history of Tango in four periods: The beginning of Tango music ("Bordel 1900"), the pubs where he started his musical career ("Cafe 1930"), continuing with tiny places where Astor Piazzolla played with his quintet ("Nightclub 1960"), concluding with New Tango - today's Tango ("Tango d'aujourd'hui"), which actually belongs to the 1980s.